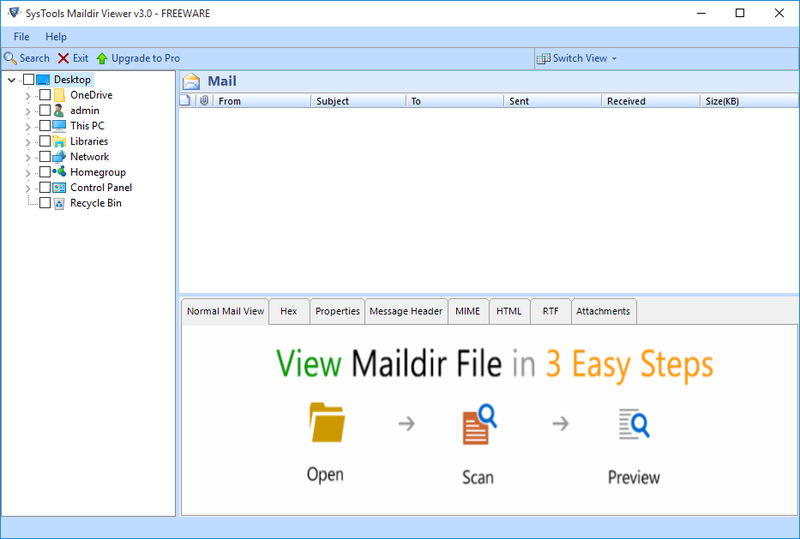 Maildir Viewer tool is able to open any type of Maildir file from any version of Windows OS. This tool helps to read Maildir file format from any server. It supports Maildir file of any size (for e.g. 100 MB Maildir file) & explore Maildir file in original format without single changes. Maildir Reader software is used to browse all files & folders from Maildir++. Portable device to explore Maildir++ file format. 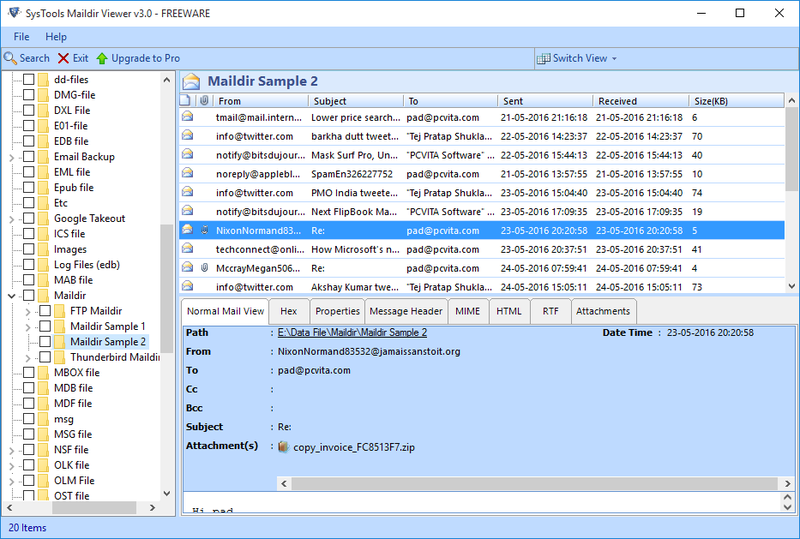 This tool offer to Preview unlimited Maildir++ files to save time and effort. A user capable to preserves the data integrity while viewing Maildir structure. Thunderbird Maildir Viewer software explore all information which related to Maildir file format. This tool open Maildir file with related information such as supporting images, files, documents, pdf, ppt, etc. Read Maildir file with associated attachments in original format without making any single changes & without data loss. Maildir Reader offer easy to use interface just Open interface -> Browse file -> View file. Maildir mail viewer is used to read mail from Maildir & Maildir++ with items. This tool offers an easy process to search, evolution Maildir and Maildir ++. 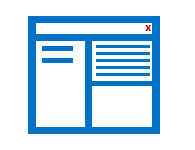 It is a completely safe and error free software with accessible on all version of Windows OS. What is Maildir File Format? Maildir e-mail file format is a common way to save mail messages, where every mail message is saved in a separate file with a single name, and every folder is a directory. 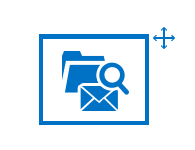 Maildir improves efficiency because individual emails can be modified, deleted, as well as added without disturbing the mailbox or other mails, and makes it safer to utilize on networked file systems(Server). What is Maildir++ File Format? Maildir++ file format supports sub-folders and mail quotas. The mail directory of Maildir++ contains subdirectories with names that starting with '.' (dot) that are also the Maildir++ file folders. Maildir++ extension is not a violation of the specification of Maildir, which clearly offers the possibility of adding more than tmp, new, and cur folder to a Maildir. 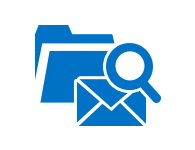 Where is the location & directory of mails in Maildir? Common files you will find in a mail directory are maildirsize, dovecot.index.log, dovecot-uidlist, dovecot.index.cache, dovecot.index.log.2, dovecot.index and folders like cur, new, tmp. Can I open Maildir file from any FTP server & from any Windows OS? Yes, You are able to read Maildir file from any FTP server and in any Windows OS like 10, 8.1, 8, 7, Vista & XP. Is there any limitation with this Maildir viewer tool? Any type of Maildir file size or quantity of files limitations on this tool. No, There is no limitation of Maildir file size or quantity of files. Maildir Reader support Maildir file of any size (for e.g. 1 GB Maildir file). 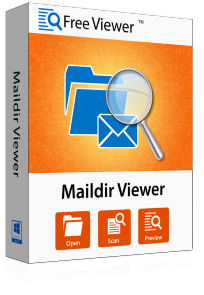 You can use this Maildir Browser software multiple times without any hassles. 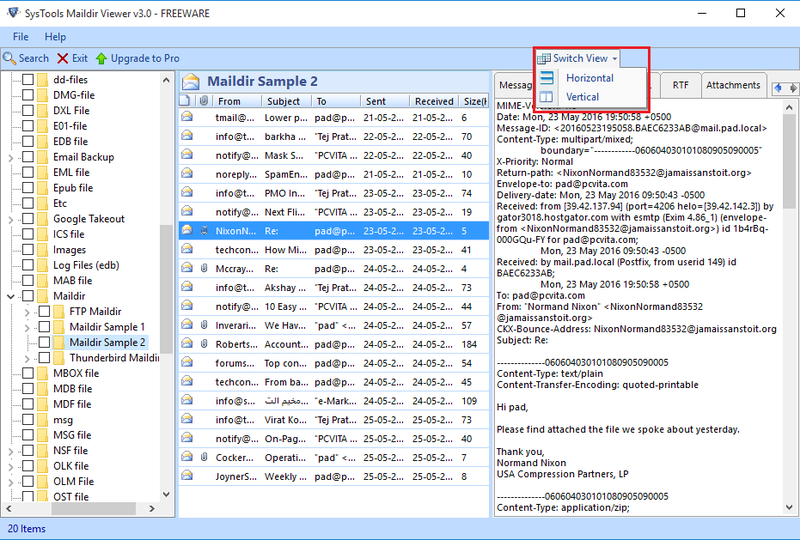 Can I save Maildir files in other file formats (PDF) by using Maildir Viewer Tool? No, This is a free viewing tool which is mainly used to open any Maildir files. 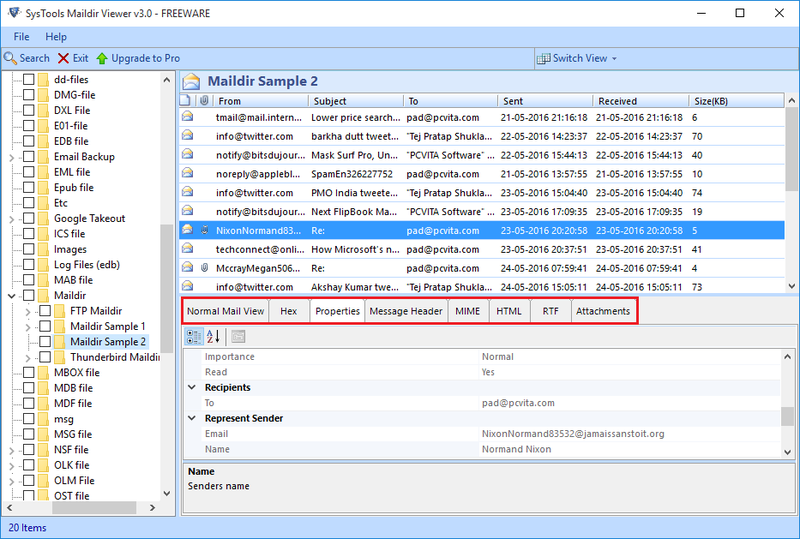 Upgrade to Maildir Viewer Pro version to save Maildir emails into PDF format. "Maildir Viewer tool is the best choice as it helps me in the perfect analysis of the Maildir data items in an original format. The best thing about the software is that it views unlimited data & unlimited size rapidly to preview Maildir files." "Maildir Reader software works greats. This tool made the process of viewing Maildir & Maildir ++ files in offline mode. 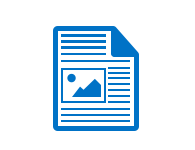 I am thankful for this superb utility, which saves a lot of time by viewing the data in batch on Windows 10 OS."